George E. Quinan can be credited with establishing the town when he headquartered his ranching operation here in the 1870s. The community even bore the name of Quinan for some time. A post office was granted in 1874. John C. Habermacher, Quinan’s first postmaster, was a mover and shaker for the fledgling community. Habermacher operated his store and the post office, but found time to serve on the school board and formed the Quinan Literary Club. In 1880, Quinan was bypassed by the New York, Texas and Mexican Railroad – but only by a quarter mile. A new site was platted and residents from Quinan moved to the new community. At this point, railroad executive Daniel E. Hungerford became the namesake of the new community and Quinan’s post office moved to Hungerford in 1883. Hungerford’s population in 1885 was 200 and the town had churches and a school as well as a gin and gristmill. The town grew and in the mid 1930s could boast three general stores selling whatever Hungerfordians needed. The town reported no disasters or fires (other than the occasional flood) and quietly went about its business. 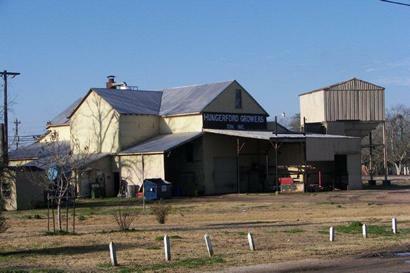 The railroad’s discontinuing service and Wharton’s proximity prevented growth. Nevertheless the 1960 census showed a population of 450, growing to nearly 500 by the 1980s. Highway 59 bypassed Hungerford in the 1980s. 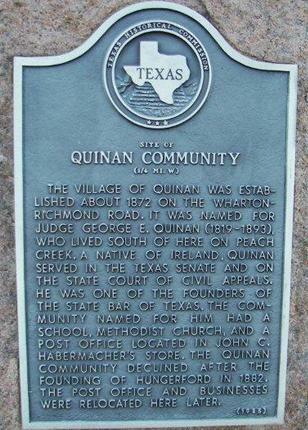 The community of Quinan is remembered in the text of a historical marker. 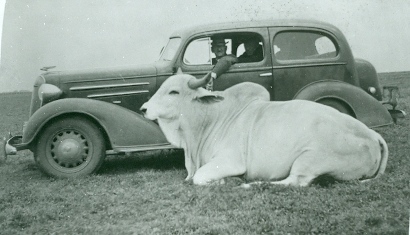 "Walter Hudgins shows off his new automobile and a Brahman bull. The Hudgins estate near Hungerford helped define the cattle and ranching industry on the Bay Prairie. Known internationally in the cattle industry, the Hudgins name stands into the present as a leader in Southeast Texas ranching." The village of Quinan was established about 1872 on the Wharton-Richmond road. 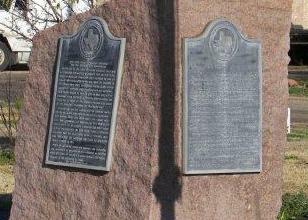 It was named for Judge George E. Quinan (1819 - 1893), who lived south of here on Peach Creek. A native of Ireland, Quinan served in the Texas senate and on the state court of civil appeals. He was one of the founders of the state bar of Texas . The community named for him had a school, Methodist church, and a post office located in John C. Habermacher's store. The Quinan community declined after the founding of Hungerford in 1882. The post office and businesses were relocated here later.